More than one billion stars are seen together in a new image of the Milky Way created by combining over ten thousand smaller images from telescopes in both hemispheres, astronomers revealed this week at the National Astronomy Meeting in Manchester. 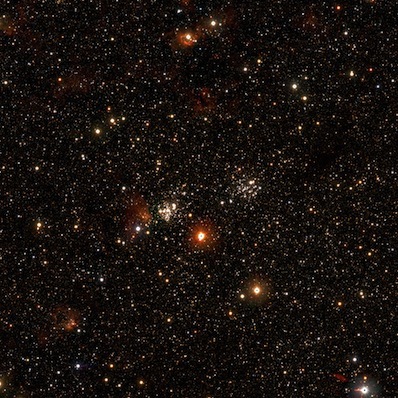 The full image contains 150 billion pixels and is published online with an interactive zoom tool centred on a large star-formation region, but even the innermost zoom contains more than ten thousand stars. Sections of the new image of the plane of the Milky Way. Click here for the pannable, zoomable version of the full image. The image comprises data captured by the UKIDSS/GPS survey taken by the UK Infrared Telescope in Hawaii with the VVV survey from the VISTA telescope in Chile, and is the result of a decade long collaboration between astronomers at the University of Edinburgh and the University of Cambridge. Zoomed in detail of the billion star image. Image: Mike Read (WFAU), UKIDSS/GPS and VVV. Everything from new star clusters and nebulae, to supernova remnants and light echoes from old supernova are likely buried in the treasure map. Click here for the pannable, zoomable version of the full image.